Yep, I pm'd @lorywindrunner ingame and spoke to him/her some about bloodmagic but i forgot that via vagan you can master craft " socket gems are supported by lv1 bloodmagic " on maces/staves. I posted the benchmarks for doing apex but overall 3.4k life is low and so is 3.3k armour @74. You really shouldn't Atziri until 80-85ish. But post your gear & passive tree here and ill let you know whats wrong or needed for trying Atziri if that's your goal. For those who haven't noticed I'm a Highgate Supporter and my divination card just recently was released. I created it for 2H Cyclone since that's all I do. The idea was it would be awesome for crafting and the chance of regaling into another T1 prefix would be the dream. 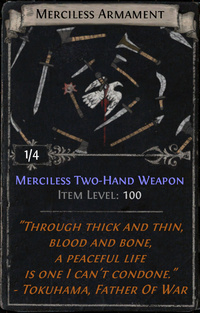 The flavor text I created was based off reading the first few chapters of the Path Of Exile: Origins Volume 1 Graphic Novel. It talks about the origin of Kaom and the Karui way; of which Tukohama ( father of war ) inspired. The quote is meant to describe the life of a berserking warrior, a marauder through life and death; basically a Cycloner. I don't doubt the card will be extremely rare given its potential; although once you own the item it can be used for re-crafting if new Tiers of Physical rolls are released due its item level of 100. Kudos for this build man! I'm using it right now for the 1 month league.Level 73 now and beyond bosses are not a problem,except for haast(or whatever his name is) i just run away hehe,and probably abaxoth but i haven't seen him yet. I went for the axe because of Disfavor,starting to save now for when somebody finally drops one. Thanks again man and congratulations on your divination card. Thanks buddy, im doing the same. Let me know if you have any questions! Why don't you grab the increased endurance charge nodes? Especially since you opt to grab things like the two life and armour/regen near the beggining of the tree? Wouldn't those be better used to get another endurance charge? Are you referring to getting additional endurance charges or endurance charge duration nodes? Post a passive tree highlighting what your talking about; It will help me understand your perspective. Great guide! Well built and many questions I've had during leveling were already answered inside the guide. 1. Sword vs Mace vs Axe. What weapon to choose from? It is stated that the highest pDPS is better but while leveling it was really hard because usually I didn't have enough dex to equip swords (which for some reason rolled higher pDPS for my level). So how would one then choose weapons, how to get enough dex at lower levels, etc. Also, what pDPS should one aim at which levels / areas. For me the transition went surprisingly smooth, but I'd guess it'd be great thing to point out so people would know when to start switching gear. Other than that, great guide! Having a blast with it in 1M. For 1MSC, would you recommend using HoA/Hatred/Haste instead of HoA/Hatred/AA? What points would you move around to attain the build for HoA/Hatred/AA? Thanks!